Announcing you've designed a new beer on the back of a trip to Bali opens up a few possibilities. While the beer scene there is changing – as we discovered last year – you may still wonder if the Two Birds crew has decided it's time for Australia to have its own Bintang (Birdtang, perhaps) or want to create a beachside cocktail in beer form. However, it turns out the inspiration came in the form of an ingredient, as the most recent trip there was during the height of mangosteen season. Not only did this allow them to inject a little "purple power" into the beer and give the in-house pun department something to play with, but it gave them an excuse to knock out a refreshing summery sour. 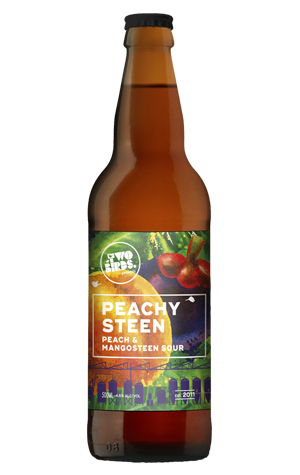 Also at play on the fruit front are peaches from the brewer's backyard and some tropical New World hop varieties, coming together with a golden haze to deliver citrus and stone fruit aromas before you find an acidic tang wrapping itself around a reasonably full and sweet midriff in which the malt character is given more prominence than in many such beers. There's a touch of lacto-derived funk and it doesn't hold back on the palate-puckering front, but does so with poise, balancing the elements nicely.